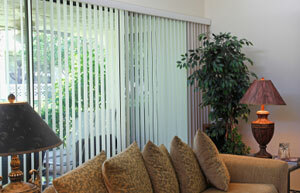 Vertical blinds are made of fabric slats, running vertically across your window (top-to-bottom). The slats are rotated using a chain to control the amount of light coming inside and can be drawn open to the sides of your windows by a pull-cord, to allow you the full view to the outside. Vertical blinds are a neat, modern-looking window covering solution, and are available in a wide range of colours and fabrics. Vertical window blinds are a highly versatile window treatment and a great choice for windows, French doors, and sliding glass doors. They cover windows and doors from top to bottom perfectly and are easily opened with the use of a built-in wand. While these blinds can offer a clean, modern look to any setting, they needn’t be plain and simple in every room. Vertical blinds come in a wide variety of textures, colours, and patterns, offering themselves as a great accent for every type of room from ultra-modern to antique, and from simple to elaborate. 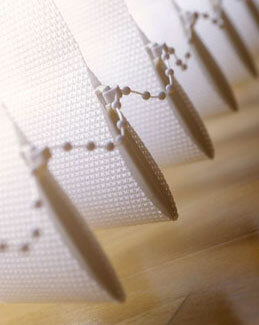 These blinds can insulate doors and windows as well as drapes. They come in varying weights and thicknesses and are capable of room darkening as well. Depending on their colour and the material used in their construction, vertical blinds are also capable of allowing light to shine through them while they are closed, softly illuminating the room with a practical level of light. Vertical blinds are always a practical and versatile window treatment. Low maintenance vertical blinds are a great alternative to drapes and curtains. Cleaning vertical blinds is often a matter of simply wiping with a soft, wet cloth to spot clean, or vacuuming with a wand to remove dust. Keeping these blinds clean is not complicated or time-consuming. If the vertical blinds are constructed of a fabric, steaming cleaning will not only remove spots but will kill any dust mites and mould. 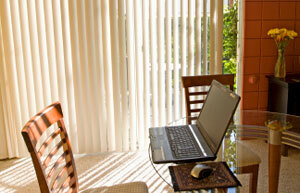 Vertical blinds are less likely to allow dust to gather on the surface that is horizontal blinds. This is due only to their orientation. When ordering custom vertical blinds, knowing how to refer to each anatomical part of the blind can be useful. The head-rail is the very top of the blind. It is the part that attaches to the wall and contains the hidden rail. The strips of the vertical window blinds are often referred to as slats or hangers. These are the main body of the blind. The wand is the stick-like part that is either twisted or pushed along the track to allow light in or block it out. Though vertical blinds technically have many more parts, these are the parts your design choices will be the most concerned with. The installation of vertical blinds is fairly simple and straightforward. In a nutshell, the headrail is attached to brackets on the wall right above the window. The slats are then connected to the clips in the track. The slats very are very easily “slipped” into the clips. A void has been punctured in the top of each slat and allows the slat to sit on the lip of the clip. Finally, a wand is attached to a tiny loop on one end of the track. The professional installation of vertical blinds is always an option as well. Depending on the climate where they are used and the materials they are made from, vertical blinds can last many years. 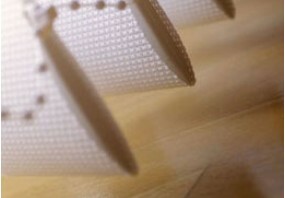 Less brittle materials in moist environments will last the longest. As with any other home accent, the higher the quality, the longer your vertical blinds will last. Vertical blinds come in all colours, many textures and weights, and a wide range of quality and price. There is sure to be a set of vertical blinds for every room. The cleaning of vertical blinds is quick and easy, and they are less apt to collect dust than some other window treatment. We’re glad your search for vertical binds online brought you here! There are always consultants available to help you select the right type of vertical blinds for your specific needs. To find out more please contact Complete Blinds on 02 8824 7975.